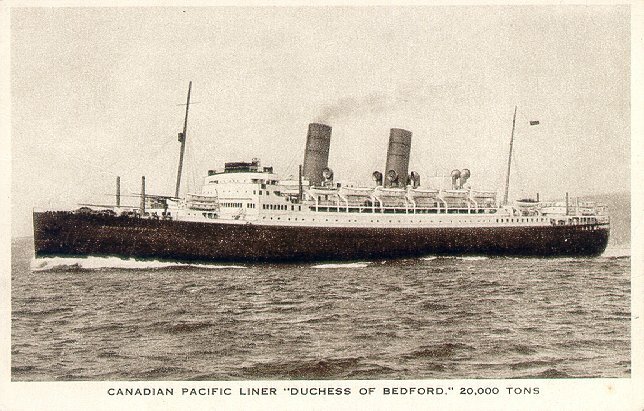 The first of the four "Duchess" ships built in the late 1920's, Duchess of Bedford was built by John Brown & Co. of Glasgow. Launched by the wife of British Prime Minister Stanley Baldwin in January 1928, the ship took her maiden voyage, Liverpool-Québec-Montréal, on 24 June of the same year. In 1933, she was chartered to Furness, Withy as a temporary running mate for the new Monarch of Bermuda. 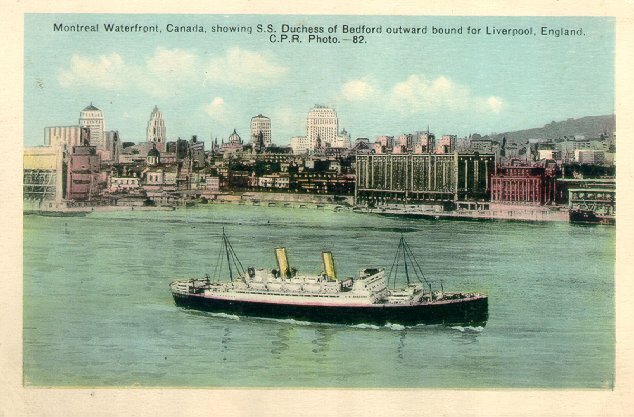 Once Queen of Bermuda was delivered to Furness, Withy, Duchess of Bedford returned to Canadian Pacific. She remained in commercial service through August 1939, served as a troopship for several months, and then returned to commercial service from January through August 1940. She then returned to trooping for the balance of the war and is credited with sinking an unidentified U-boat in August 1942. Decommissioned in 1947, she was sent to Fairfield Shipbuilding & Engineering of Govan for refitting. Initially, she was to be renamed Empress of India, but after India gained independence, her new name was changed to Empress of France. The ship returned to service, as Empress of France, in September 1948, on her former Liverpool-Québec-Montréal route. She was given pepperpot funnels during a 1958 renovation, and remained in service until 1960, when she went to the breakers after 310 North Atlantic roundtrips. Sister ships: Duchess of Atholl; Duchess of Richmond/Empress of Canada (II); Duchess of Cornwall/Duchess of York. Sources: Bonsor's North Atlantic Seaway; Haws' merchant Fleets.